I never went to Disneyland or the Walt Disney World Resort as a child. In fact, I was not able to go until I was 28 years old, on my honeymoon. Nevertheless, my mother instilled and then nurtured in me a desire to visit Disneyland. As a boy she would tell me about Disneyland, take me to Disney movies and adorned my section of the apartment with items of interest that reflected a Disney experience. Among these items was my collection of View-Master reels. In the days before home video, you could only see a Disney movie when it was in general release in the theatres or on television if an edited version was featured on The Wonderful World of Disney. Your other option was to indirectly experience the films through record albums with companion books, comic books, coloring books, and View-Master reels for example. 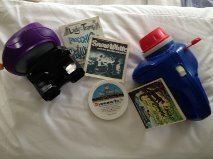 I had all of that stuff and then some, but today I want to focus my attention on the View-Master experience. A poorly cropped photo of a stereoscopic viewer with a stereo photo of the Leaning Tower of Pisa. Many decades later, View-Master expanded on that concept by creating the familiar rotating discs that would hold seven different color images, and the iconic companion viewing device. A package typically included three reels comprising seven distinct 3-D images for a total of 21 images. The viewing device had a window displaying a brief description of the corresponding image in the viewer. Each package also contained a booklet that described the images in greater detail. That was it; 21 images and a few descriptive words. Not much, but in a world without home video, they kept the memories of a good movie vivid, moreover, they could connect you with the world and instill a positive sense of longing and anticipation. I owned many reels inspired from Disney’s classic animated features and cartoon shorts. 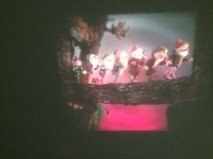 For awhile, the manufacturers of View-Master did something interesting with animated films. 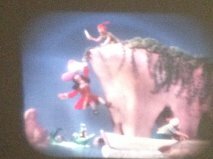 Rather than take stills from the actual films, they used the artistic style of the films to craft three dimensional figures and scenery. These marvelous recreations became the subjects of the photographs used for the reels. The reasoning behind this approach remains a mystery to me, but the novelty enhanced my enjoyment. I was impressed how detailed the sculptures were, how good the color was, how faithfully they told the story and how well they created the illusion of motion with these images. “Heigh Ho! ” It’s off to work they go. One day her prince did come and they all lived happily ever after. When I was older, say six or seven, I received a View-Master projector for Christmas. Now I could project the images onto a wall and turn my apartment into a movie theatre. 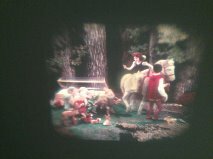 On summer nights, I would have public showings of the View-Master versions of Snow White and the Seven Dwarfs, The Jungle Book, Peter Pan and Donald Duck cartoons, while reading aloud the narrative provided in the booklet. I may have even charged a penny for my efforts, but I provided refreshments. Peter Pan bests Captain Hook again. When The Walt Disney World Resort opened in 1971, already a View-Master enthusiast, I was given a special set comprising five reels, each reel dedicated to one of the themed lands in the Magic Kingdom. I also received another set that had pictures of Disneyland and The Haunted Mansion. All of these reels were my gateway to the Magic Kingdom. I didn’t casually view these images; I studied them. They sustained me until I finally got to go some twenty years later. 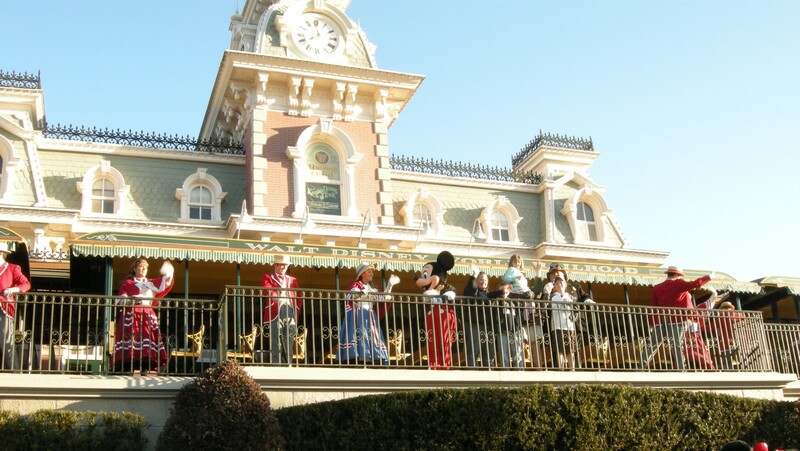 When I arrived at the Magic Kingdom for the first time, it actually felt like I was returning home. Even though the Magic Kingdom has changed a great deal since it opened. 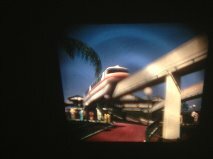 If I ever want to go back to a time when the cable cars carried you over Fantasyland to Tomorrowland, or take a deep sea voyage on the Nautilus, I need only take out my View-Master reels and the adventure begins. 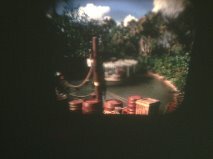 The View-Master reels were one of a handful of toys that I saved from my childhood. When I had children of my own, I rediscovered them and purchased new ones that reflected the movies of the day. We added Harry Potter, Sesame Street, and Pixar as well as new issues of Disney classic animated films to our collection. 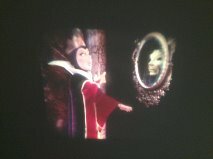 On summer nights, just as when I was young, I would use the projector to put on a little show on the wall. Today’s children can watch professionally created souvenir DVDs that are sold in the parks. They can watch their own high definition home movies. They can also watch You Tube for quality recordings. They can watch them on a television, or a tablet or a phone with greater resolution than ever before. These are good things, but in a world of gifs, Instagram posts and ephemeral Snapchat images, there’s something satisfying and calming, especially for young children, in observing a simple image. The stillness permits, no beckons, one to be drawn into the moment, study a particular image, and savor the beauty. It may seem counter-intuitive to engage today’s children with such a low tech activity, but young ones will naturally take to it. 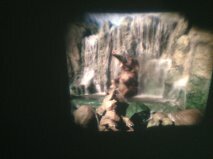 Older children might even try this out of a sense of nostalgia if they experienced View-Masters when they were young. If you saved your View-Master reels, it’s time to unearth them from wherever they are buried. One evening treat yourself and your family to a slow-paced virtual trip to the Disney theme parks. If you do, write to us and tell us about your experience.